Ambassador of the Islamic Republic of Pakistan to the U.S.
After the program, Contributors' Circle members are invited to attend an exclusive dinner with the Ambassador. Not a Contributors' Circle member? Upgrade now to see what you're missing. As he explained in his first major public statement, a February 8 interview in The Washington Times, Pakistan's relationship with the United States has grown stronger since May 2011 when, as the paper reported, "dialogue was halted as a result of the secret U.S. commando raid that killed Osama bin Laden in Abbottabad, Pakistan." Nowadays, the ambassador, who took the position in January 2014, says the relationship between Washington and Islamabad is "on a very positive trajectory." At a special meeting with The Christian Science Monitor last week, Ambassador Jilani said that if the Obama administration delays its 2016 military withdrawal from Afghanistan, it would be an act "viewed very positively in Pakistan." But there are many facets to the U.S./Pakistan relationship, not the least of which is China's potential influence and the Pakistan/India situation. Roger Cohen, in a February 23 op-ed piece for The New York Times, suggested there may be a synergistic connection between China and Pakistan. He asked the question, "Does rising China make its formal entrance to the world diplomatic stage by trying to mediate talks between the Afghan Taliban, the Afghan government of President Ashraf Ghani, and a Pakistani ally sobered by the very belated realization that the Taliban it has fostered for 'strategic depth' (which may mean the fanciful notion that a semi-controlled Afghanistan could give it maneuvering room against India) is also a mortal danger to Pakistan itself?" In one paragraph, the writer touched on the many challenges facing Ambassador Jilani and Pakistan as the Ambassador works with Washington in this more communicative era. The ambassador has vast experience in foreign affairs and diplomacy, including a foreign office assignment to Washington from 1995 to 1999. 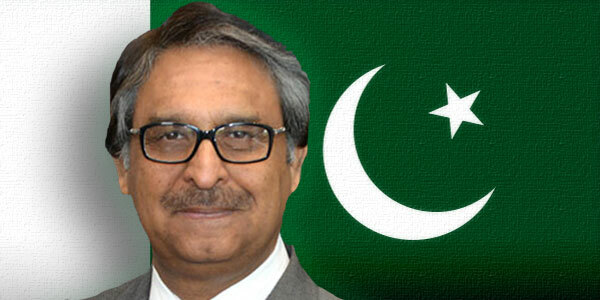 From March 2012 to December 2013, he was Foreign Secretary of Pakistan. He has also served as Pakistan's ambassador to Belgium, Luxembourg and the European Union and was Pakistan's High Commissioner to Canberra, Australia. His career in foreign affairs also took him to positions in India and other South Asia offices. And, his Embassy biography notes that the Ambassador is an ardent reader. In this warming diplomatic era, he has something in common with President Obama. The biography notes, "In his spare time he plays golf."